Choosing The Right Kitchen Countertop | Hampton Kitchens Inc. The best place to start before selecting a new countertop is to look at what you currently have. Is the countertop material keeping pace with your lifestyle? Are you an empty nester who needs a more stylish surface rather than one that is functional and practical? Perhaps you’re a growing young family that needs more durable, easy-to-clean countertops because of your hectic lifestyle. A quick assessment of your countertop will help you make easier decisions during your kitchen renovation. With a new kitchen renovation design in hand, homeowners need to think about the areas in the kitchen where they will cook, entertain, craft, read, etc. The design professionals at Hampton Kitchens will guide you through the counter surfaces that meet these needs. Plus, homeowners should think about how much time they’re willing to spend on maintaining their new countertops. Some countertop materials, including concrete, wood, and granite, require waxing, oiling or resealing. Other materials, such as engineered stone and solid surfaces, require little to no maintenance. Today, a homeowner can find a wide selection of counter materials – natural and man-made. Some of the popular countertop choices are quartz (such as Cambria® or Caesarstone®), solid surface (Affinity™ or Corian®), granite, plastic laminate or Formica®, stainless steel, glass, concrete, and wood. Canadian homeowners are also mixing and matching counter surfaces in different areas of their kitchens, like granite and butcher block. Each material has features and benefits that may or may not be important to you. 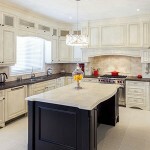 Hampton Kitchens design professionals can help you make an informed choice. Countertops come in a wide range of colours and textures. When selecting a countertop, there’s one thing to remember: make sure your countertop compliments the other materials you have selected for your kitchen (cabinets, back splash, floor) in natural light. There are also many ways to enhance the look of your new countertops by selecting different decorative edge styles and finishes. New countertops will also affect other areas in your kitchen and even your home. Don’t forget about the impact that sinks, fixtures, backsplashes and appliances, such as built-in ovens or stoves, can also have on the countertop. If you are hiring a contractor for your kitchen renovation, do your homework. Did you know that home renovations and repairs are one of the top five consumer complaints in Ontario? To protect yourself and your investment, ask friends and neighbours for a contractor they used and recommend. Get estimates in writing. At Hampton Kitchens, we build and install cabinets and warrant all our work and products. Hampton Kitchens will also work with your builder or renovator or help coordinate your renovations with one of our trusted affiliates. No matter if you want a brighter colour, a more durable material or a way to rearrange your counter space, taking the time to select the right countertops will enhance your kitchen and home for years to come. To use these images in the post, copy and paste the 'Link URL' of each image into the corresponding field in WordPress's media uploader. To use these images in the post, copy and paste the 'Link URL' of each image into the corresponding field in WordPress's media uploader.